It’s just mixing ingredients together, stirring in oil and syrup and putting it in the oven. This granola is great for breakfast, an afternoon snack, or I even have it for dinner sometimes when I’m really hungry and get home from work too late to cook. This recipe has healthy fats, proteins, slow-burning complex carbs, many minerals and other nutrients, AND it’s gluten free (don’t be fooled by the word “wheat” in “buckwheat”, it’s actually a wheat-free, gluten-free seed). The herbs and spices in the Chai blend have traditional medicinal qualities. They’re warming and boost the metabolism, both, much needed during these cold winter months. The flavor is quite robust, in a good way. I tend to lean more toward bold flavors, rather than subtleties, especially in winter. 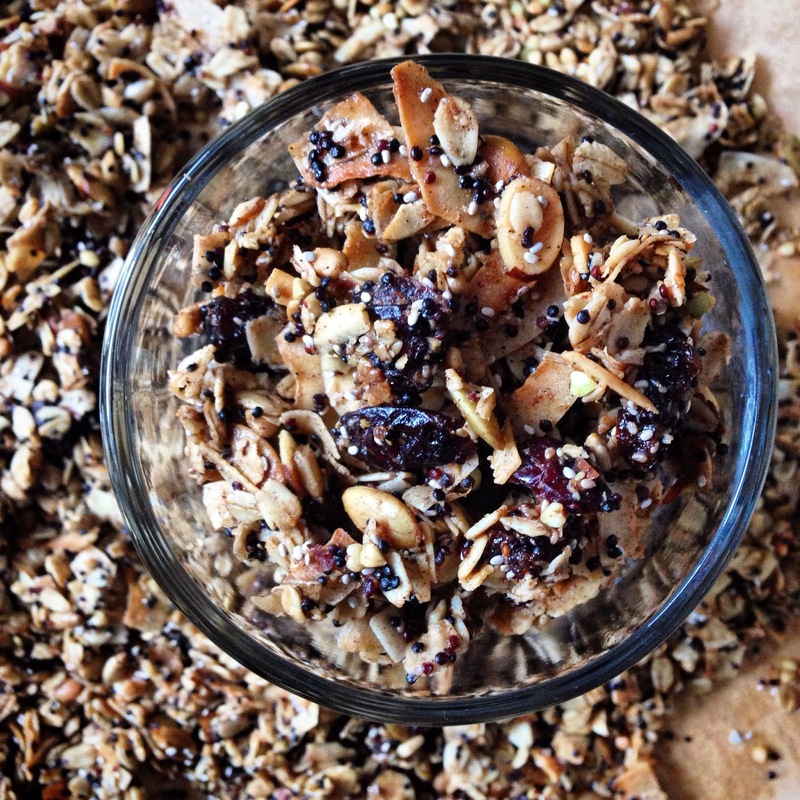 This granola is crunchy and chewy and all kinds of tasty. Enjoy it alone, with almond or coconut milk, kefir or yogurt. It also adds a nice crunch on top of smoothie bowls or oatmeals. I use a wide range of ingredients. I keep these nuts, seeds and grains stocked up all the time. If you don’t, don’t sweat it, omit what you don’t have and fill out the dry portions with something else. In my mind, whether following a recipe or not, cooking is a creative process not meant to be taken too seriously. Follow you and your family’s tastes and have fun! P.S – this smells absolutely AMAZING while it’s roasting. You can find the recipe for my Chai Spice Blend, here. Preheat oven to 225F and line a baking sheet with parchment paper. Melt coconut oil in a pot on the stove on low. Once melted, remove from heat and add in syrup and vanilla. Pour oil/vanilla/syrup over dry ingredients and stir really well to coat. Spread evenly on the parchment paper. You may need to do two rounds or use two baking sheets. You don’t want it piled too high that the middle-bottom doesn’t get cooked and roasty. Remove from oven and let the granola cool on the parchment paper. Once it has cooled, break off into pieces. I lift the edges of the parchment lightly and sort of jiggle it. I like to keep some bigger pieces, rather than all crumbles. Store in airtight glass container. *Note: Just after putting my second batch into the oven, I had to run out. I wasn’t sure how long I ‘d be so I dropped the temp. to 170F. When I returned home about 5 hours later, I turned it up to about 350F for ten minutes to brown up the edges. It turned out awesome too – drier and crunchier – but just as awesome in a different way. I think it’s important to know that there isn’t only one right way, and there is definitely some flexibility for this recipe to match your moment. I support organic farming and recommend that, when available, ingredients be certified organic. Next Post Skillet Saturdays: Gluten-Free Banana Bread! Beet Juice, Beet Juice, Beet Juice!